The tour resumes at Walbrook Junction where the WM's Tide (left) and East Subdivisions meet. 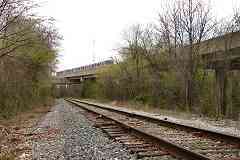 For future reference, note in the distance the blobs of concrete and green color near each other left of the track. Closer than the blobs is a brick train orders office of the WM. 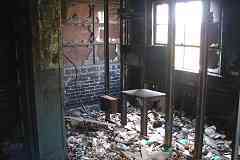 This was a WM train orders office. 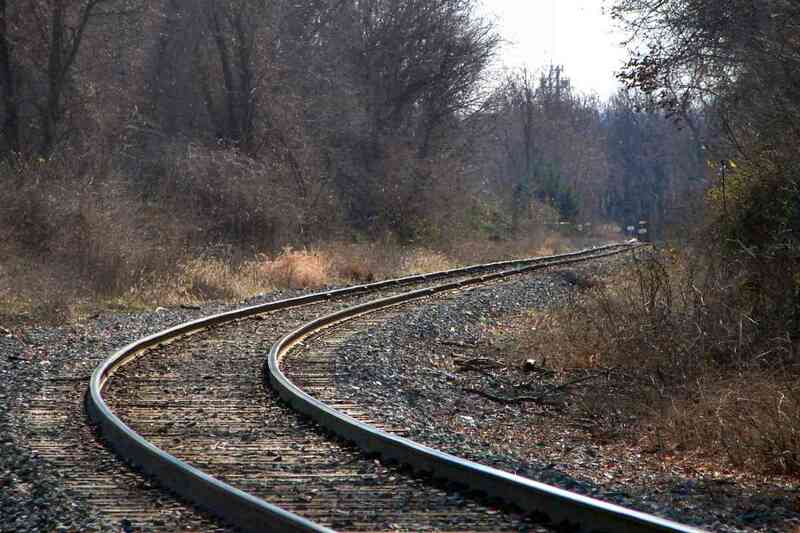 Prior to the 1980s, a dispatcher communicated instructions to staff at a train orders office, who then passed along the directives to train engineers. The system was a holdover from the days of wired telegraphy, before radio permitted dispatchers to talk directly with a train's operator. 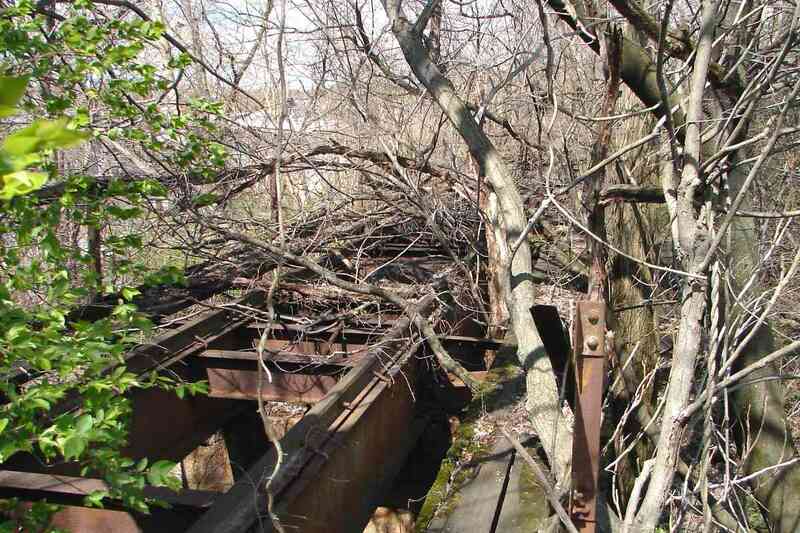 Perhaps if a new rule required people to trash unoccupied railroad structures, they'd stop doing it. 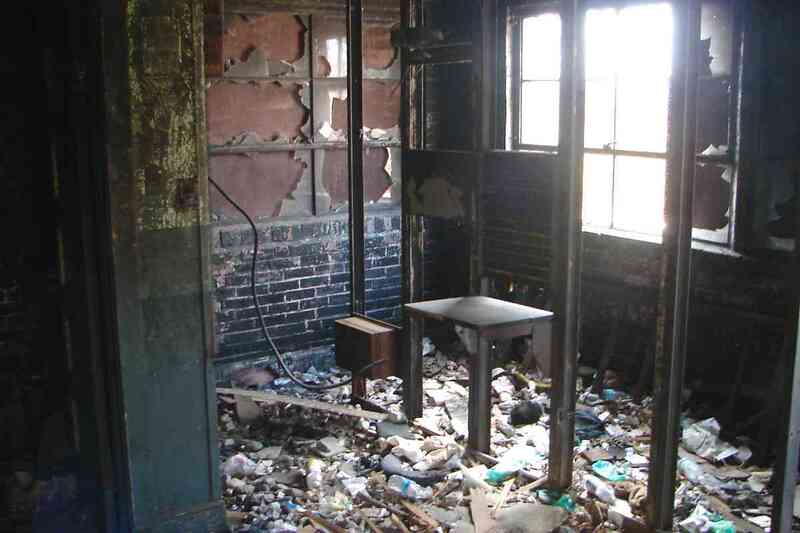 Most of the switchboards, wires, and equipment have been torn out, but a desktop remains. 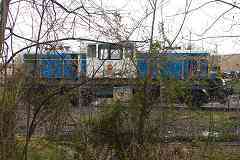 The office had plenty of windows so staff could see approaching trains. Windows, desktop, mice, and soda bottles. It's the perfect old coders rest home. 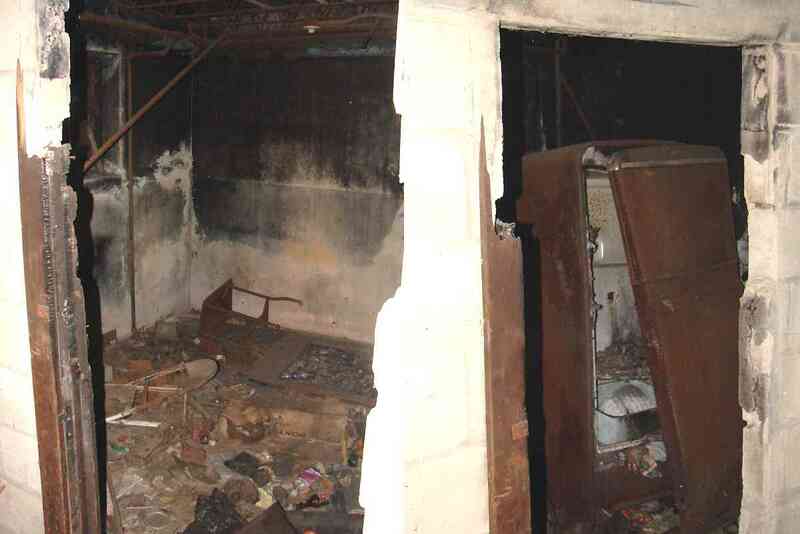 The basement contained a refrigerator and lounge, perhaps even a cot for sleep. 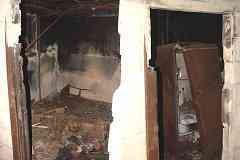 This photo is a composite of two that look at different angles through the same doorway. 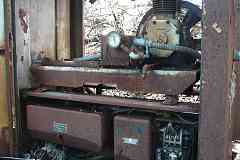 A backup generator kept the orders office humming in the event of a power failure. 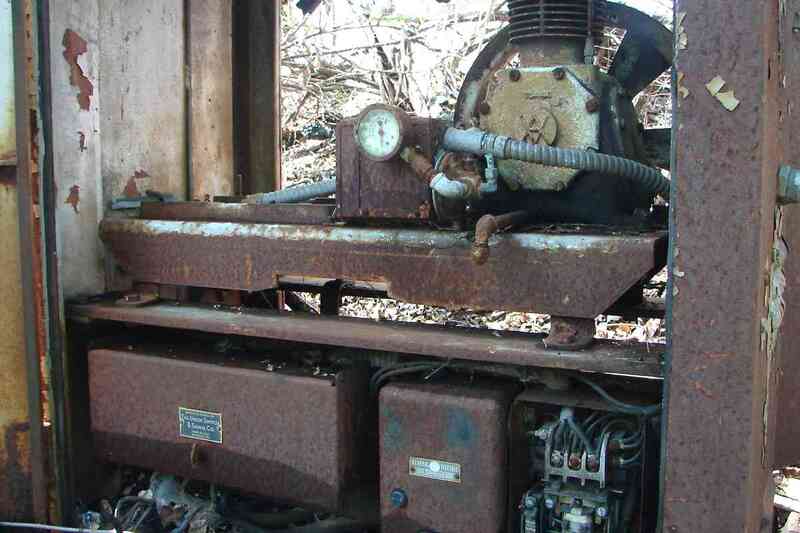 Given the Union Switch and Signal label the generator was probably connected to the nearby signals as well. Remember the concrete blob? 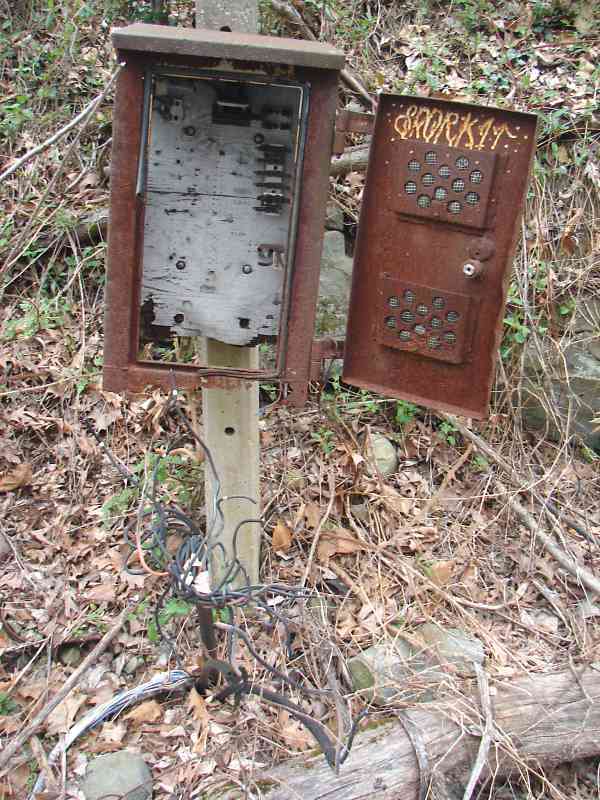 Here it is up close, the surviving base of a signal or related equipment. 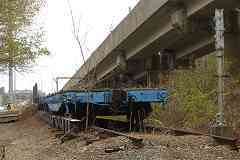 The siding behind is elevated, likely to permit easy offloading of bulk materials such as coal or sand. 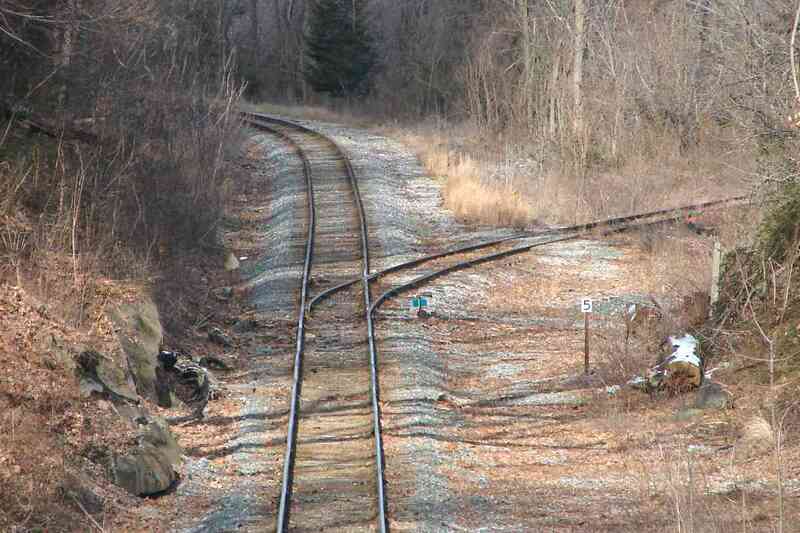 The siding is no longer connected but its rails remain. Does anyone recall what type of business it served? Though this location is a mile west of the Tide Sub's milepost 3, milepost 4 is about 1000 feet farther west, and probably reflects the measurements of the East Sub. There's the concrete base again, and now the green blob is revealed as the reverse side of a speed sign. 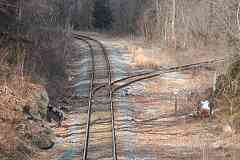 This used to be double tracked. Here's a look during double-track days when the WM's Walbrook Station was active. 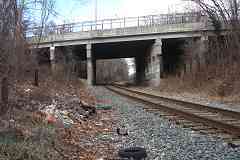 The station was adjacent to North Avenue where passengers could switch to trolleys to take them to downtown Baltimore. 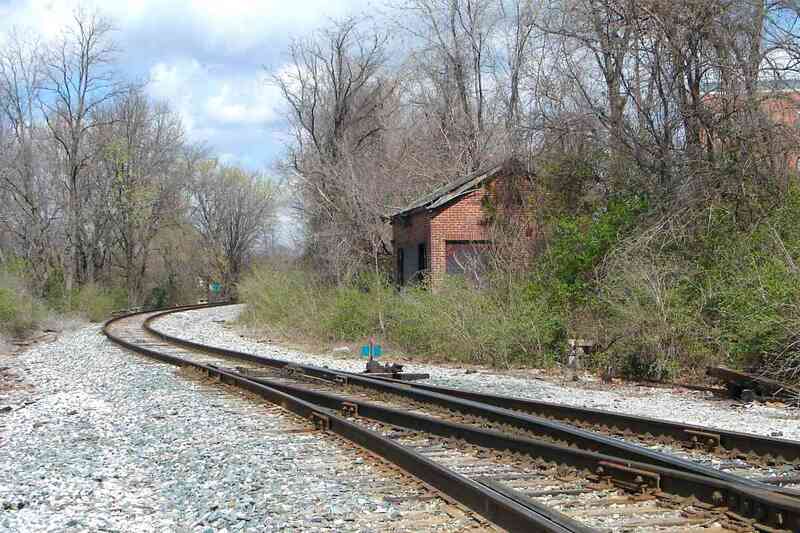 The WM added this station specifically to reduce the number of passengers who would ride their trains farther into Baltimore, which meant a trip through the B&P Tunnels, for which the WM had to pay 10 cents per passenger. Roughly the same view about a century later finds much has changed. Due to declining demand the WM demolished the station during 1954. 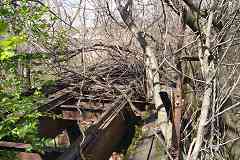 A passenger platform fence, now rusty, remains on the left. The bridges ahead span North Avenue, and beyond them we finally spy milepost 4. 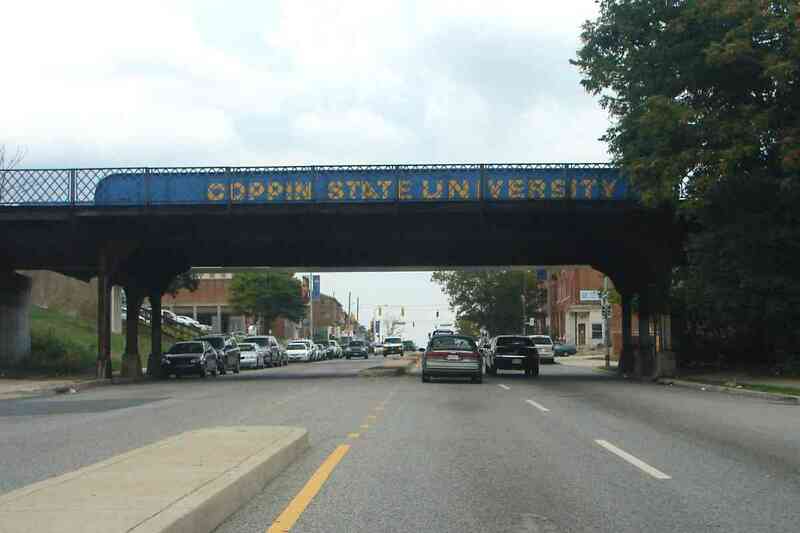 At North Avenue, so named because at the time of construction it marked the northern limit of development of the city of Baltimore, Coppin State University has been expanding. 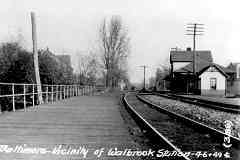 While Walbrook Station existed passengers climbed stairs up to it within the green area on the left, between the student walkway (close) and the train bridge (farther). 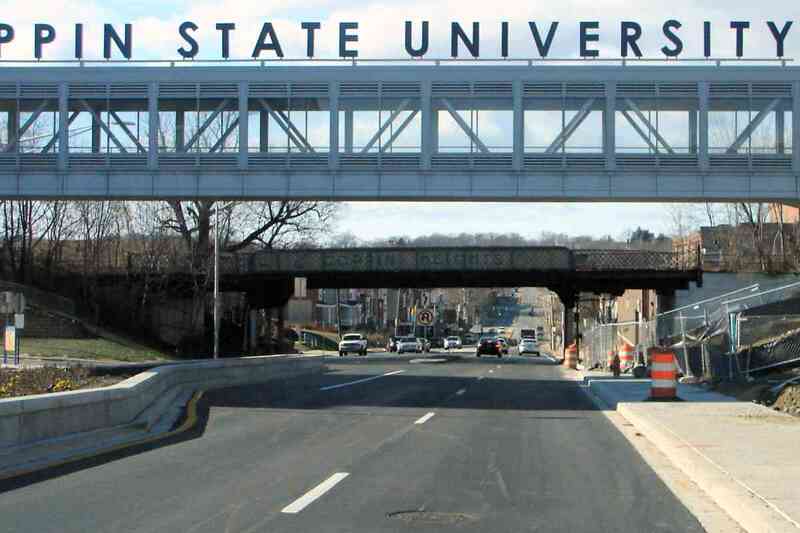 This view looks the reverse direction before Coppin State's expansion began here. 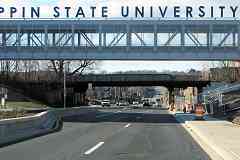 After following the edge of the campus, zooming back finds the signposts at North Avenue. 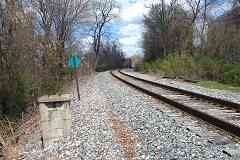 The rail line marks the quiet west edge of school property. 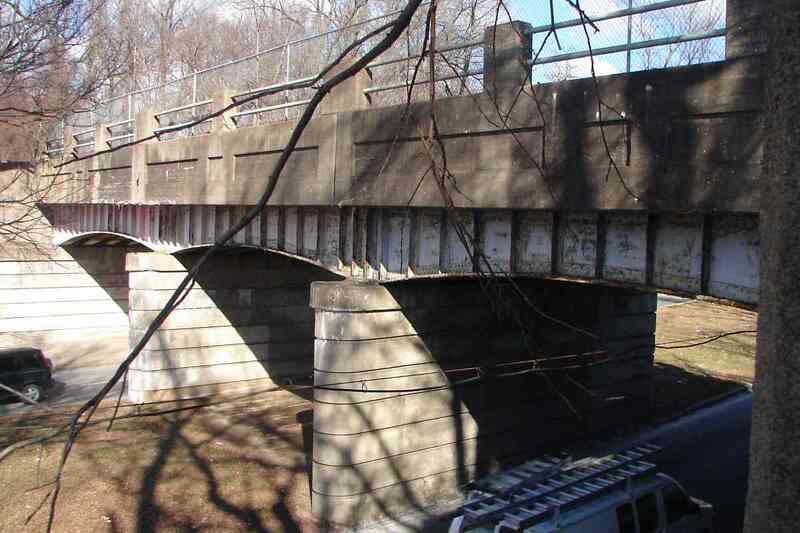 Low-angle winter lighting reveals CSX has not deemed the traffic level sufficient to justify upgrading from bolted track to continuously welded. 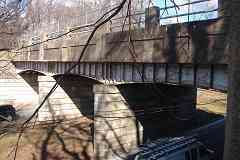 Perhaps the grandest of the WM land bridges in Baltimore City is this one spanning the road to the Gwynns Falls. As I can personally attest, during heavy thunderstorms the road here itself turns into a stream. 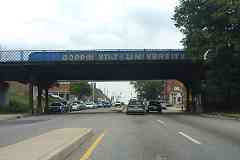 The name Gwynn is derived from Richard Gwin who settled in this area during the 1600s. 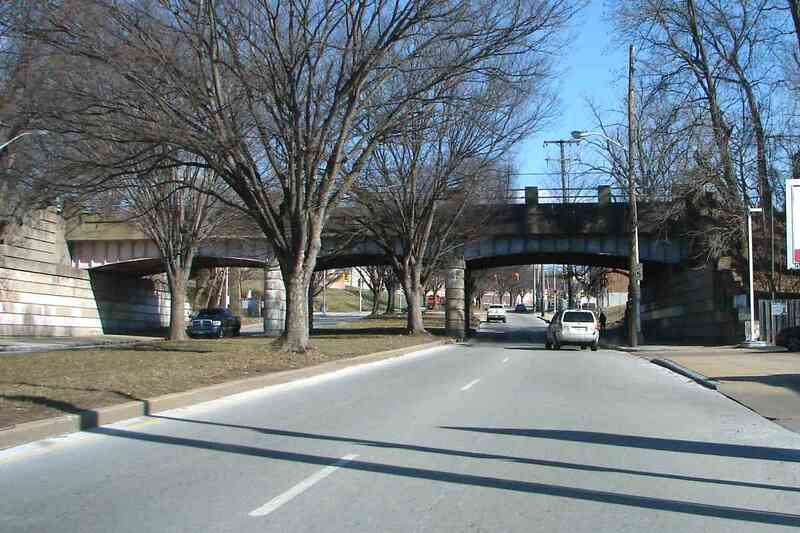 Important Baltimore streets with medians like this are found scattered around the city, often remnants of the streetcar era, however this wide boulevard was designed as open space under the oversight of Frederick Law Olmsted. I was hoping to find W E S T E R N M A R Y L A N D spelled out completely on the bridge, and indeed remnants of the letter A appear near the center of the closest span. Skip a panel between letters plus a few in the middle and the full name just fits. The other side has been repainted more colorfully. Everything blue would have been more appropriate since this was the coldest day of January with wind chills way below zero. 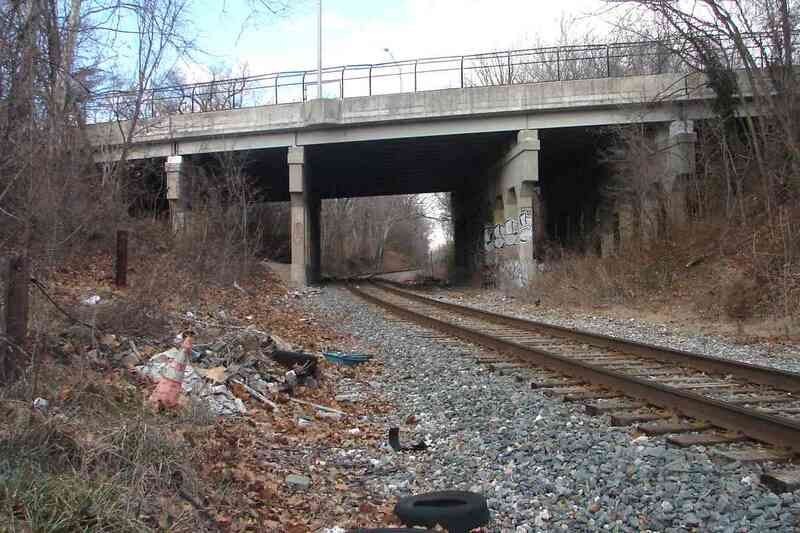 Less than a half-mile later, the railroad transitions from running over streets to running under them. 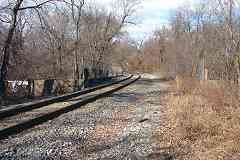 During the 1800s the WM had met what was then known as Old Liberty Road at grade. 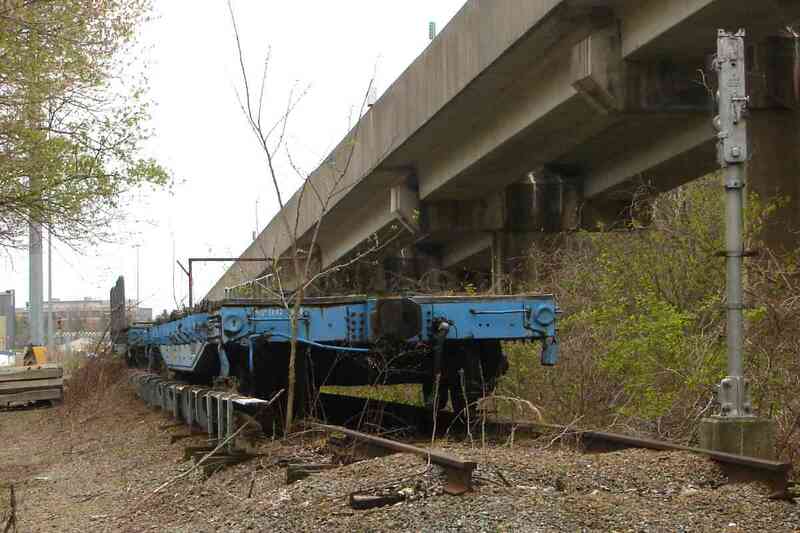 The Liberty Heights bridge is a good spot from which to view a passing freight but few were running here at photo time. We'll check out that siding in a moment. 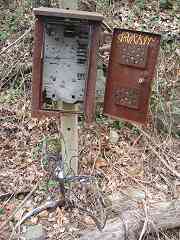 At milepost 5 this appears to be a leftover WM telephone callbox that train crews used during pre-radio days. 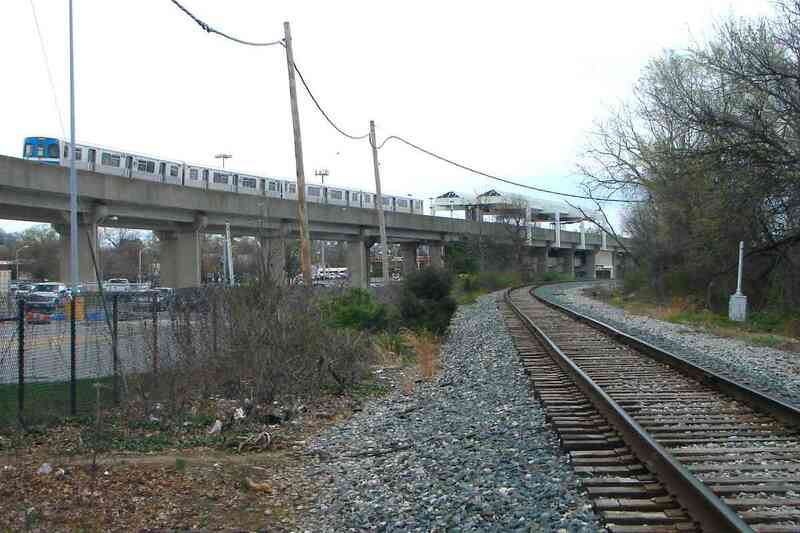 The "siding" is the Baltimore Metro Subway's (only?) 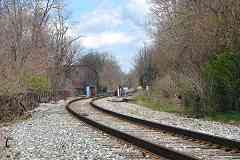 connection with the outside rail network. 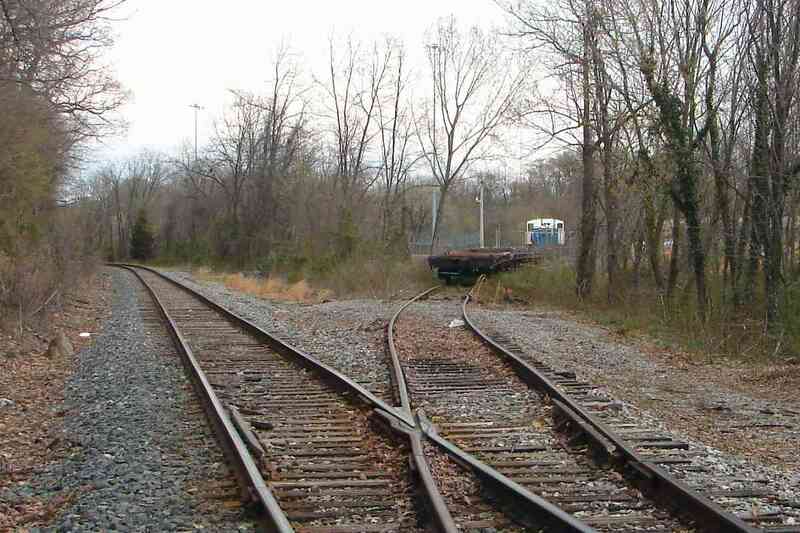 New subway cars are delivered via this track, with help from a MOW switcher of course. Don't expect to snap good unobstructed fence-free photos here. 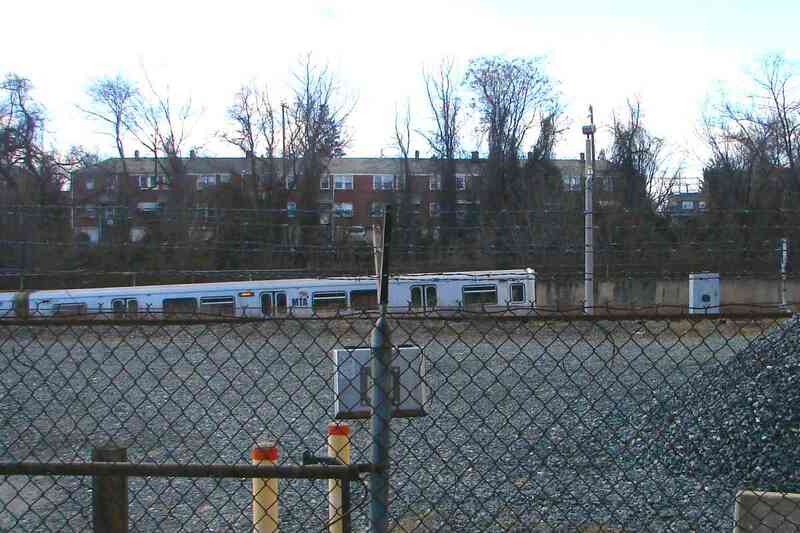 Given the electrified third rail, understandably the yard is sturdily fenced while security cameras watch. 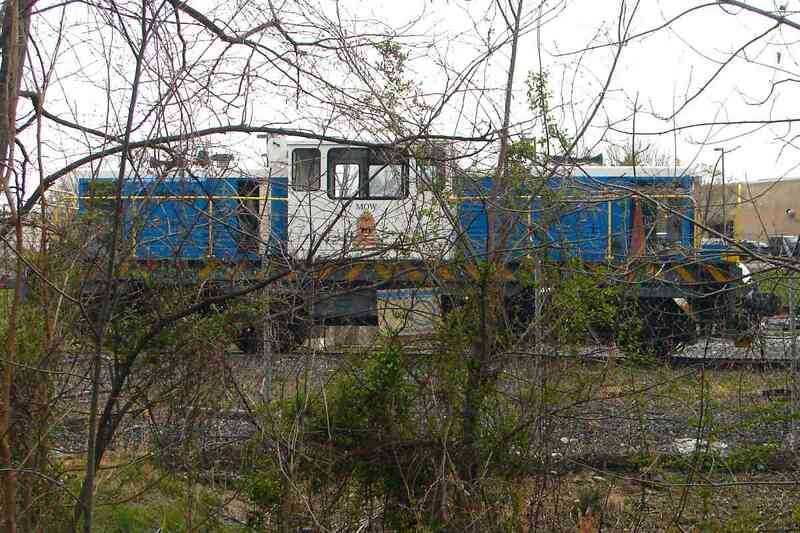 No, that's not a train sinking into quicksand. 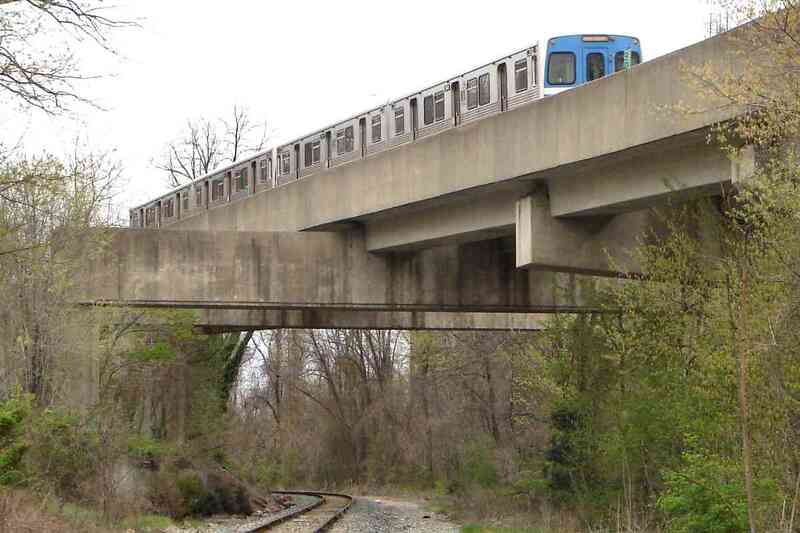 Here the subway transitions from underground to ground to elevated operation. Previously a different kind of ride had graced this area: an amusement park roller coaster. 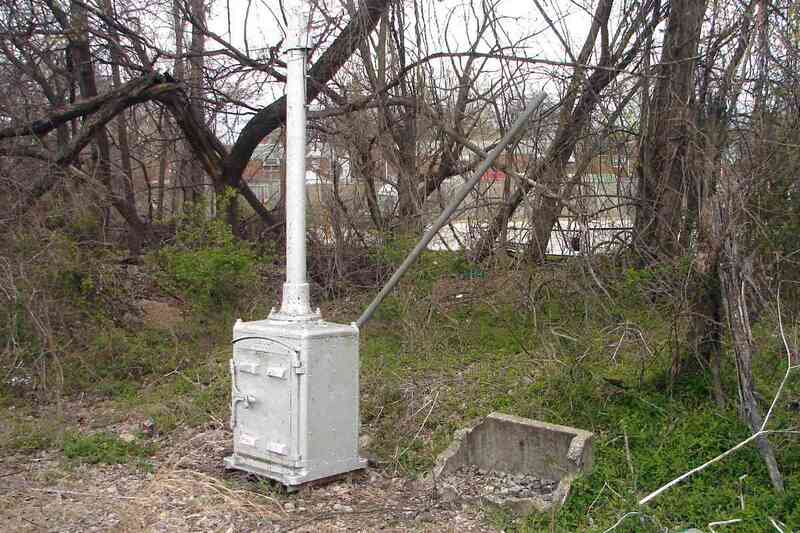 An attraction of the first amusement parks was their use of the newfangled invention called electricity. 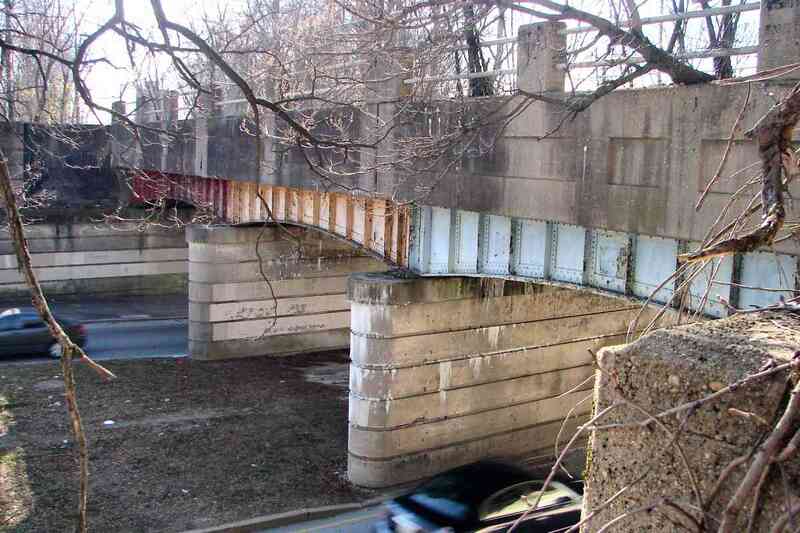 These photos were snapped at the end of Carlin's Park Drive where during the mid 20th Century a pedestrian walkway into the back of that park had extended over the WM tracks. 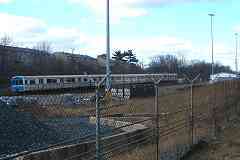 Metro's yard now occupies the western portion of the site of Carlin's Amusement Park that had opened during the early 20th century. 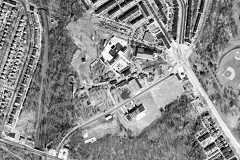 That's the WM running bottom to top along the left edge of the aerial photo. 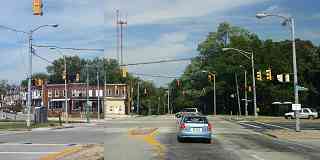 At Liberty Heights Avenue (bottom left) the roller coaster made a 180-degree turn. 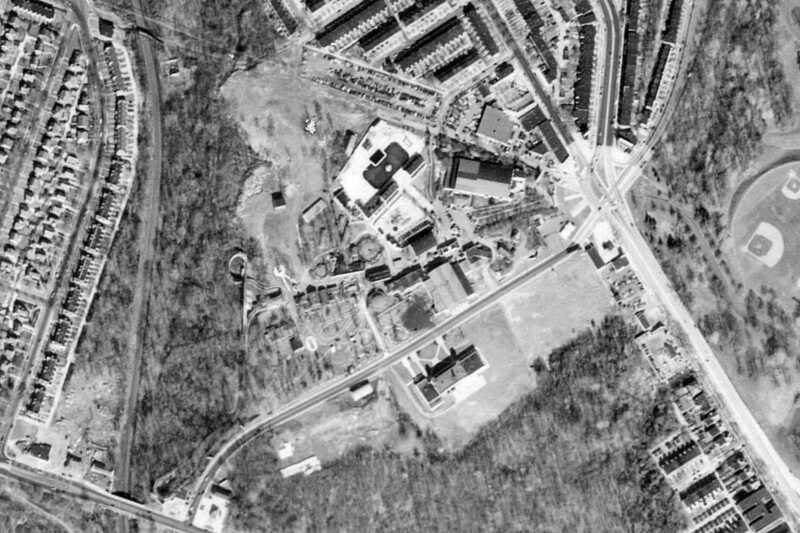 Several roads met at Park Circle (upper right), the park's main entrance. Park Circle began as a traffic circle adjacent Druid Hill Park (or, in Bawlamerese, "Droodle Park") but now is a large expanse of blacktop. 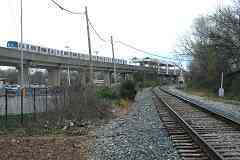 At photo upper left you'll find the previously-mentioned pedestrian walkway over the tracks. 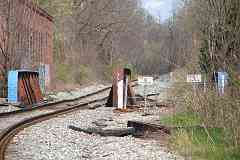 It does not appear WM passenger trains stopped here. After fire destroyed its skating rink, in 1958 Carlin's morphed itself into a drive in theater, the only one within Baltimore City. 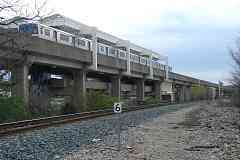 It survived until 1977 followed soon thereafter by Metro construction and then operation that began during 1983. 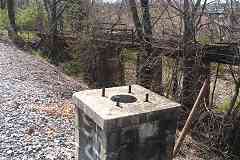 Other parts of the park now see industrial use. Anyone have some Carlin's memories to share here? This is the only place within the city at which Baltimore's Metro and the ex-WM line cross. After this the Metro will remain on the southwest side of its inspiration, parallel for miles until outside the city limits. 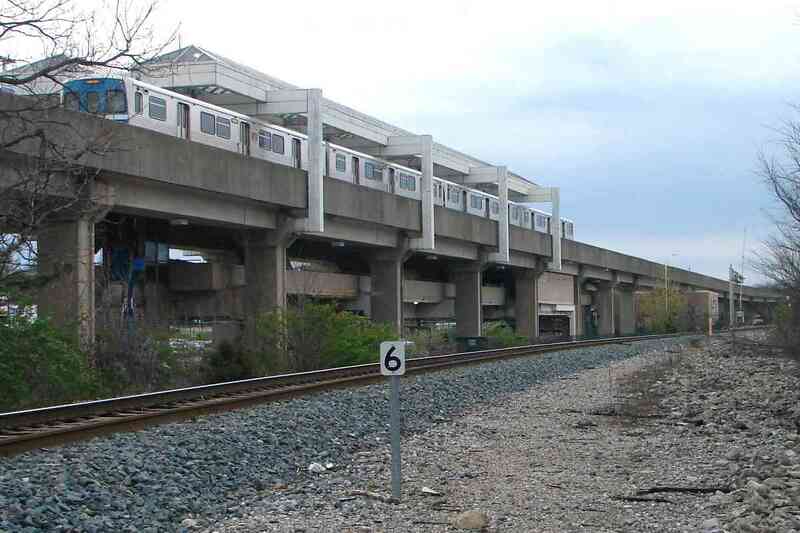 Baltimore's single subway line runs from Owings Mills to Johns Hopkins Hospital. 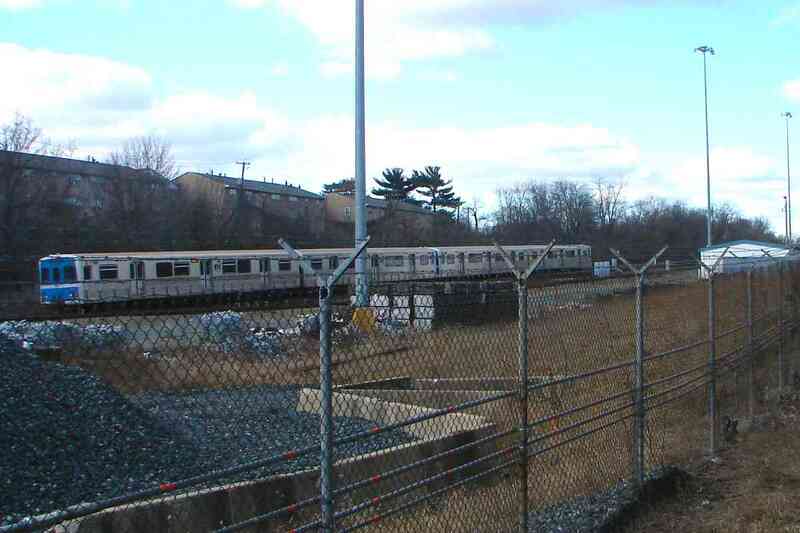 Part of Metro's yard is over on the right, already obscured by spring foliage. 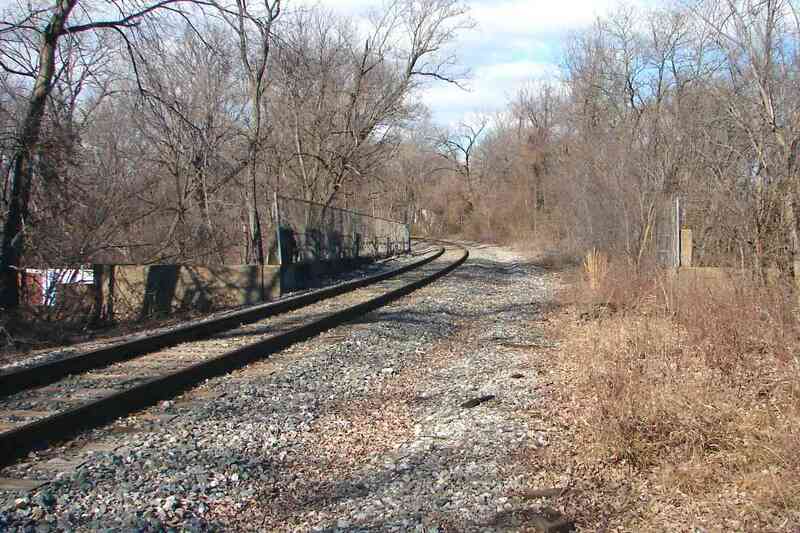 The third-rail left of the track reveals this is a subway yard. There is no bumper post (the spindly tree doesn't count -- yet) so cars roll off the track end from time to time, as suggested by the repaired fencing through which this photo was snapped. The Baltimore Metro's first elevated station, that at Cold Spring Lane, is an overhead spot from which to see the WM. 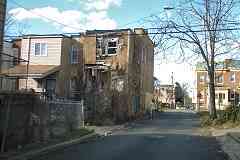 This area, south of Pimlico Racetrack and east of the railroad, has deteriorated during recent decades. 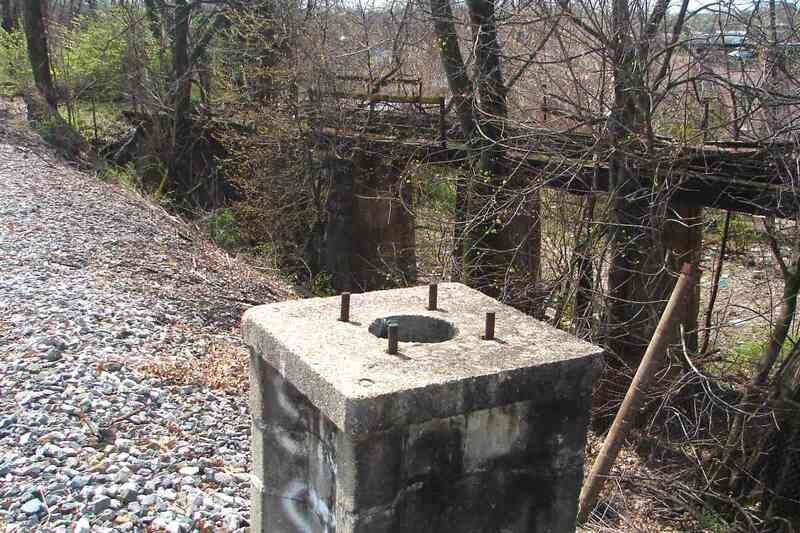 This is one of the spots at which I heard gunshots (or fireworks) while exploring. 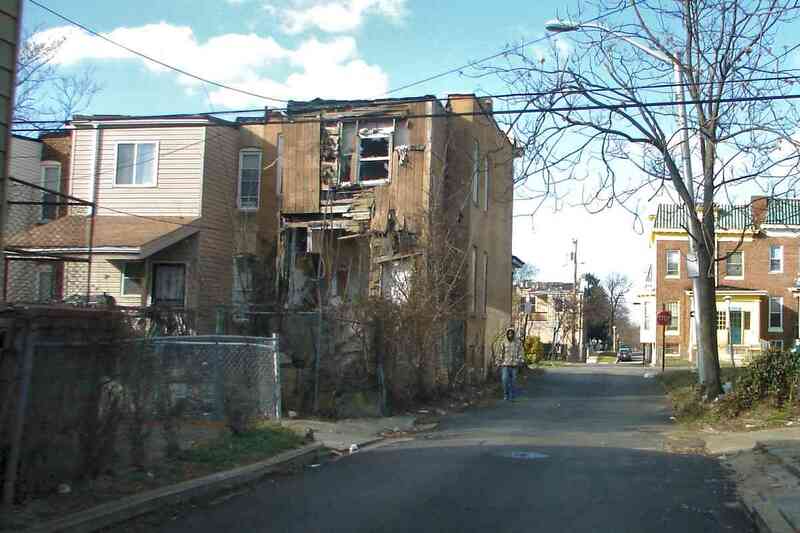 The percentage of collapsing and boarded-up homes is high. 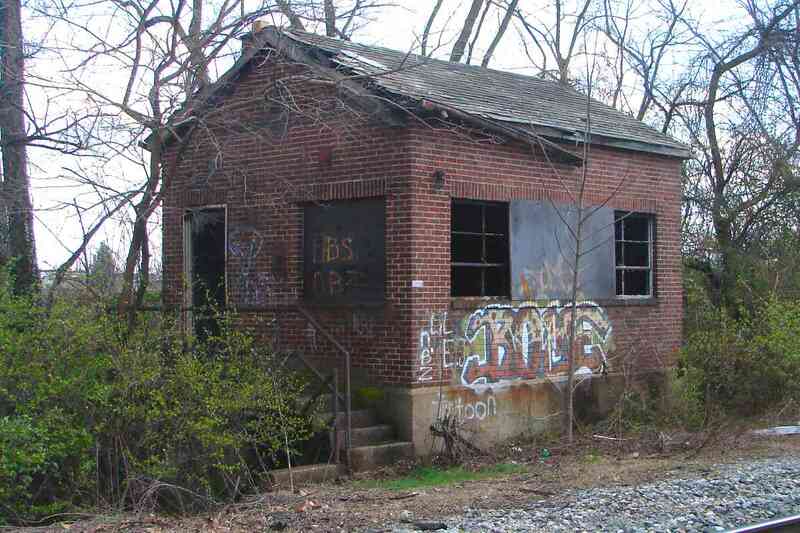 Someone not long ago repainted this old WM signal box complete with pole. Only a few of these remain extant. 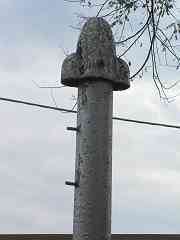 Wires would loop down from the pole's covered top, then to the signal held by the bolts shown at right. 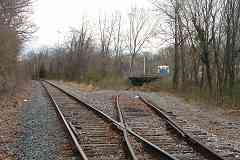 This signal, like other ex-WM signals on the line, may have operated into the 2000s. The adjacent, now-disintegrating concrete box previously held battery backup power. In the weeds lurk rails of a disused siding that may have served the aggregates facility behind. Subway trains greatly outnumber CSX freights at milepost 6. 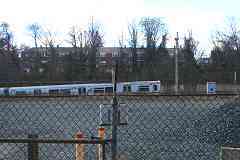 These Budd Corporation-built cars are identical to ones in Miami, Florida. The Cold Spring Lane grade crossing, just beyond the bend, is where this tour picks up on the next page.